This Sunday, our readings present two seemingly contradictory aspects of God. But are they really all that different? In our first reading (1 Kings 19:9, 11-13)the Prophet Elijah is hiding in a cave on the mountain of Horeb because the people are trying to have him killed. He encounters God, not in the grand theophanies of wind, earthquake or fire, but in a "tiny whispering sound". At the mountain of God, Horeb, Elijah came to a cave where he took shelter. Then the LORD said to him, "Go outside and stand on the mountain before the LORD; the LORD will be passing by." A strong and heavy wind was rending the mountains and crushing rocks before the LORD -- but the LORD was not in the wind. After the wind there was an earthquake -- but the LORD was not in the earthquake. After the earthquake there was fire -- but the LORD was not in the fire. After the fire there was a tiny whispering sound. When he heard this, Elijah hid his face in his cloak and went and stood at the entrance of the cave. 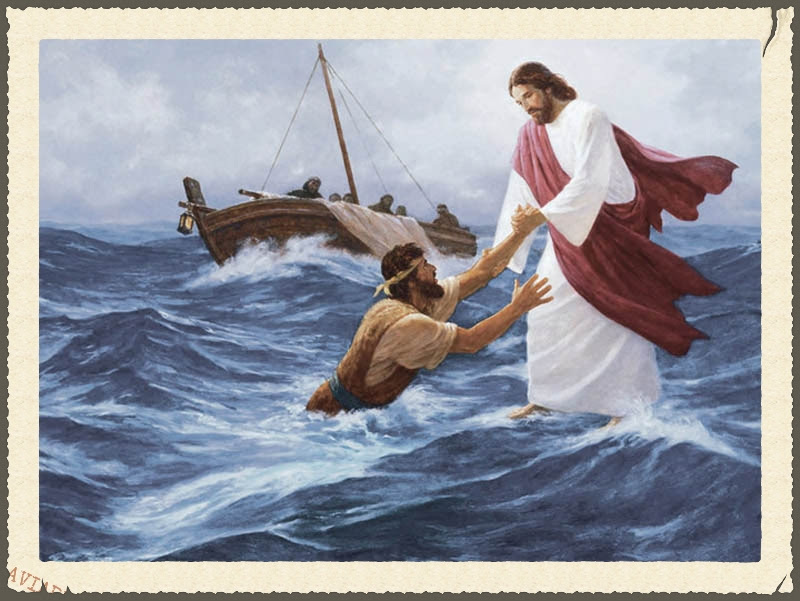 Our Gospel reading (Matthew 14:22-33) is the account of the disciples being tossed about by stormy seas and they see Jesus walking toward them on the water. "Take courage, it is I, do not be afraid", Jesus called out to them. Peter walked to him on the water but lost faith and began to sink, until he reached out to Jesus. "Lord, save me!". "It is I" is seen as a reference to God's self revelation to Moses in Exodus 3, "I AM who AM". The boat can be seen as a metaphor for the Church or for our own lives. After he had fed the people, Jesus made the disciples get into a boat and precede him to the other side, while he dismissed the crowds. After doing so, he went up on the mountain by himself to pray. When it was evening he was there alone. Meanwhile the boat, already a few miles offshore, was being tossed about by the waves, for the wind was against it. During the fourth watch of the night, he came toward them walking on the sea. When the disciples saw him walking on the sea they were terrified. "It is a ghost," they said, and they cried out in fear. At once Jesus spoke to them, "Take courage, it is I; do not be afraid." Peter said to him in reply, "Lord, if it is you, command me to come to you on the water." He said, "Come." Peter got out of the boat and began to walk on the water toward Jesus. But when he saw how strong the wind was he became frightened; and, beginning to sink, he cried out, "Lord, save me!" Immediately Jesus stretched out his hand and caught Peter, and said to him, "O you of little faith, why did you doubt?" After they got into the boat, the wind died down. Those who were in the boat did him homage, saying, "Truly, you are the Son of God." In our Epistle (Romans 9:1-5) St. Paul expresses his profound anguish over the rejection of Jesus by his own people. He would rather suffer greatly for their sake. He then explains how blessed the chosen people of Israel truly are. Brothers and sisters: I speak the truth in Christ, I do not lie; my conscience joins with the Holy Spirit in bearing me witness that I have great sorrow and constant anguish in my heart. For I could wish that I myself were accursed and cut off from Christ for the sake of my own people, my kindred according to the flesh. They are Israelites; theirs the adoption, the glory, the covenants, the giving of the law, the worship, and the promises; theirs the patriarchs, and from them, according to the flesh, is the Christ, who is over all, God blessed forever. Amen. What we may learn from our readings today is that even in the midst of the storms and earthquakes of our lives, and our Church, the tiny whisper of our God is the same, "Take courage, it is I, do not be afraid". What St. Paul expressed in his letter was great anguish over his "kindred" who have rejected that tiny whisper. In our deepest tempest, we but have to call out, "Lord, save me!"